I refer to my previous notice re the Youths Trial game fixed for Tuesday next 29th September 2015 in Clare. Please note that the venue for the game has been changed, the game will now take place at the Tulla Utd AFC grounds, Tulla, Co.Clare. Please ensure that Players are made aware of the change in venue and that they should be at the ground no later than 6-30pm. Anyone unable to attend should contact Declan Farmer at 087-2598799. Limerick have been drawn with Cork AUL, Kerry League and the West Cork League in the Group stages of the Oscar Traynor Trophy. Limerick will travel to Cork and Kerry while the West Cork League will visit Jackman Park. First Round games to be played by October 31st. Phone: 021-4311526 (Office), 087-8345020 (Mobile), Fax: 021-4311526The following players have been selected for a Munster Youth trial game on Tuesday next 29th September in the Clare League Grounds. The local soccer fraternity were saddened tonight by the news that Wembley Rvs have pulled out of the Premier League leaving the famous club with no representation in the League. As a reminder below is a copy of the clubs history from their website giving only a glimpse of how great the club were in their day……..
Hopefully we see them back next year rejuvenated. In 1934 when a group of young men from the Watergate area of Limerick gathered together to form a football club little did they realise the name they chose was to become the most feared and respected in the city. Wembley Rovers a name synomomous with good football in Limerick for the past 50 years. The founders were Eddie “Polo” Ryan, Stephen Quinn, Paddy Quinn, Eddie Walsh, Paddy Moloney, Jonny Kenehan, Christy Kenehan and Joe & Jerry Doyle. As it stood some of those present were members of Shelbourne FC. At the time there was no team in the Watergate area yet it was renowned for its good footballers. They entered local soccer that year with a junior team and how they took their name is interesting while most teams took their names from their area Wembley took theirs from a local dancehall. The Wembley dancehall was at the time the most popular meeting place in the area and it seemed only obvious for the founders to name the club after it. Although there were not many teams in Limerick the standard was high and a new team entering competition was hard in attempting to establish itself Wembley were no exception and for the first five years were out in the cold as far as success went. After a couple of years they entered minor and juvenile grades. Juvenile grade at that period catered for players up to the age of 16 years The 1940’s were perhaps Wembley’s most successful era at National level, 1941 saw them win the FAI minor cup the first Limerick club to do so, 1945 beaten in the FAI Junior Cup Final, 1946 beaten in the FAI Junior Cup Semi Final. But of course 1940 was a historic year for the club as it saw them win their first trophy. They won the Juvenile Cup beating Pike Rovers 3-1 in the Final at the Markets Field, scorers for Wembley that memorable day were Rory Quinn (2) and Ger Ryan. The referee was the ever popular local man Tommy Creamer. The Wembley team lined out as follows : Jimmy Maher, Willie O Flaherty, Jimmy Kelly, Mike Carroll, Sean Fitzgerald, John “China” Carroll, Ger Ryan, Pat McLoughlin, Pat O Connor, Rory Quinn, Paddy Daly, they were trained by Stephen Quinn, Paddy Moloney and “Polo” Ryan. That same year the minor side reached the final of the area cup. Their opponents were Caledonians who were going through one of the best spells any team has gone through. Played before a packed attendance at the Markets Field, both teams were well matched and the only score of the game was by Mick Dillon for Cals. 1941 was perhaps a year of joy and heartbreak for the young Wembley side for although it does not appear in the record books they won the FAI minor cup that year, captained by Willie O Flaherty they beat Rossville of Dublin 2-1 in the final at Tolka Park. 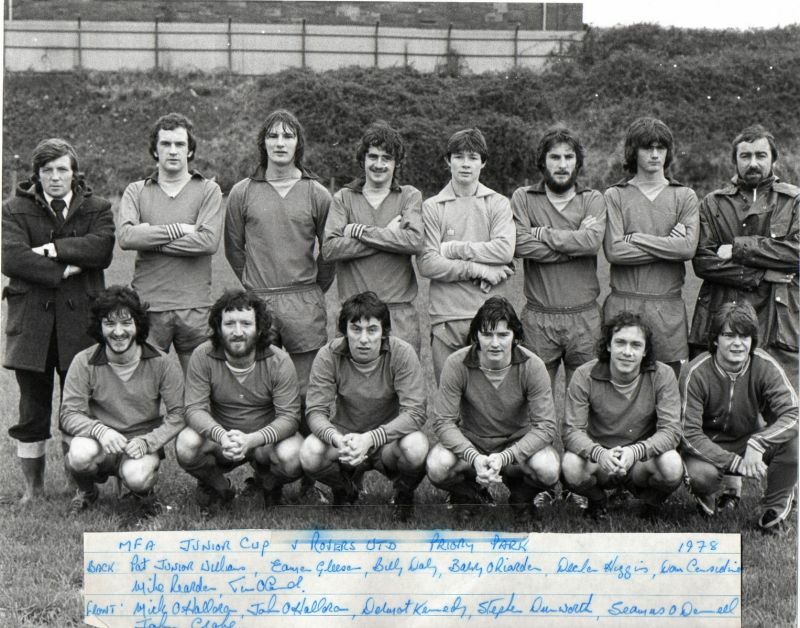 The scorers were Mick Sullivan and Jim “Shels” Costelloe. However one of the Wembley players was slightly over age and somehow Rossville got to hear of it and lodged an objection which was upheld and as a result the cup was taken back and awarded to Rossville. It was a great achievement for the club to reach the final and to beat the holders as Rossville are the only team to win the trophy three years in a row. Also most of the players on the Wembley team were young enough to play juvenile football . In 1942 the minor side captained by Rory Quinn lost to a fine Prospect side in the semi final of the minor cup at Cals Park. By now the club like the rest of Limerick clubs were having trouble fielding teams due to the war. While war had a disrupting effect on local soccer it made it impossible for National competitions to be held in 1943. To compensate for this local competitions were held all over the country to replace the FAI Junior and Minor Cups in Limerick the replacement competition called the Regional cup was played for. This cup was only played for once and Wembley had the honour of winning. In the final of the FAI Junior competition played at the Markets Field they beat Star Rovers 5-0. One of the Wembley players that day was Phonsie O Donnell who was arguably one of the best players the club has produced. That same season they went out of the local junior cup at the hands of Park Rangers. With the score sheet blank and only minutes remaining they were ahead on corners which counted if there was no score. The keeper dived to save a back pass from going for a corner. But the ball was deflected under him and into the net giving Park Rangers a somewhat lucky winner. Included in the team that day were Jimmy Maher, Lee Costelloe, Phonsie O Donnell , Josie Conway, Mick O Sullivan, Christy Fitzgerald, Rory Quinn, Dave Young and Sean Slattery. The club went through one of its best ever periods during the forties and early fifties. They emerged from the war in a better fashion than most other clubs and this soon became apparent, as they won almost every junior trophy available to them, In 1945 they won the Creamer Cup the first year it was competed for. In the game played at Dalymount Park they were beaten 1-0 by Rockviille of Cork. The winning goal was scored by Rockville centre forward “Brasso” McCarthy who was later to play with Evergreen Utd. The Wembley team that day lined out as follows Dan “Gurkie” McMahon, Jimmy Kelly, Willie O Flaherty, Phonsie O Donnell, Mick O Sullivan, Kevin “Tex” O Dwyer, Paddy “Mogwa” Lysaght, Frank Cowhie, Jim “Shelo” Costelloe, Josie Conway, Jimmy O Connor, Reserve Buddy O Grady. Again in 1946 Wembley reached the semi final of the FAI Junior Cup only to lose out at the stage. Over the next ten years they became the best junior club in town, not surprising considering the players they were fielding. Among the many honours they won during that great period the North Munster Cup, Creamer Cup, Inter County Cup, City Shield, Saxone Cup (twice) and the Lawson Cup three years running. Few other teams have won as many Junior Competitions in one great spell in 1952 they won the Lawson Cup the first year it was played for and then retained it the following two seasons. The members of the first team were as follows Jimmy Maher, S Flanagan, M Reddan, G McNamara, Andy Tier, Phonsie O Donnell, T Moore, M Downey, Tom Clifford, F Callaly, Arthur Sheedy, of that team Maher, Reddan, McNamara, Tier, O Donnell, Clifford and Sheedy appeared on all three cup winning teams. In that great period they went from being beaten FAI Junior Cup finalists to losing almost their entire team to limerick FC a blow which really finished them off as a junior force to be reckoned with. However the club had the foresight to return to schoolboy football when graded schoolboys was introduced in 1953. They entered three teams in under 13, 14 and 15. This was a barren spell for Wembley as their names appears on no local trophy . However the withdrawal of Summerville Rovers from schoolboy football in 1959 provided Wembley with one of the most talented hard working and successful soccer mentors of the past 50 years in the persona of Tony Hayden. Tony set about re styling the clubs schoolboy structure a successful operation that is still benefiting the club today. His enthusiasm was infectious and in the 1959/60 season the U13 team captained by Arthur O Sullivan in winning the league and conceded only one goal and that from a penalty. A record that still stands today. Throughout the 1960’s while Wembley continued to dominate the schoolboy’s scene 1963 saw the junior structure of the club collapse and the junior team withdrawn from local football. The arrival of Junior Keane to the administrative side of the club in 1971 changed the course of the club again. He was mainly responsible for the Wembley colours returning to the junior arena of local football in 1974. Powered by the successful schoolboy players of the 60’s Wembley rose phoenix like to again begin their dominance of junior and minor football. In 1974 the minor team captained by Pat Nolan made a clean sweep of all local trophies, 1975 saw them win the area FAI Junior cup and the B division league. The following year saw the Saxone Cup return to the club. The Munster minor cup was won by the club in 1979 under the captaincy of Mike Reardon where they beat Ballincollig (Cork ) in the final at Turners Cross with a score line of 3-1. Scorers that day were John Cusack (2) and Joe Nash. That same minor team were to produce five of the team that won the Lawson Cup that same year and were also to give the youngest player at 16 to win a Lawson Cup is Eugene Considine. While the junior and minor sides of the 70’s were enjoying such success the schoolboys were going from strength to strength winning practically every trophy available to them. A focal point of the schoolboy’s success was shown when 14 limerick district schoolboys league sportstars were awarded to Wembley players in that period. The 1980’s saw Wembley continue their good fortune in all grades of football and in this the Golden Jubilee year saw the club again create a little bit of history by becoming the only club to win the 1st and 2nd Division junior soccer titles in the same year, added to that the Junior A’s won the 1st Division cup to complete the league and cup double. The U15 squad went one better by winning the area FAI Bank of Ireland cup and the u15 league & cup under manager Fachtna O Donovan and the under 12 cup was taken by the under 12B’s team. Basking in the success of the present let us not forget the men who started it all like Eddie “Polo” Ryan and his aforementioned colleague of 1934 , Mick Sullivan whose total dedication as a player and later as a mentor to Wembley Rovers was matched only by the unselfish devotion of the late Eddie Whelan. We look back to the great days of the past to the boys and men some still happily with us others gone to their eternal reward with pride. To the men who have graced the international field not just in soccer but in other sports also. Men like Sean Cusack, Joe Waters, Ivan Morris & Derry O Donovan and everybody who wore the famed Blue and White thanks for making a great club.